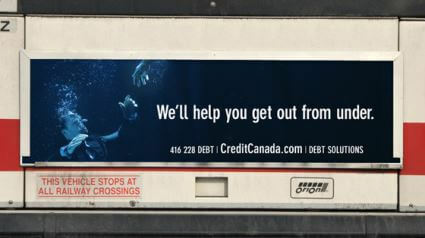 I’m pleased to announce that Credit Canada has launched our new multi-media advertising campaign called, “Get Out from Under.” For debt-ridden souls in need of rescue, the campaign features a very apt metaphor. It highlights visuals of people escaping the murky depths of the sea with the aid of a helping hand. The net take away here is that with the help of certified credit counselling and reliable financial coaching anyone can rise above problem debt. The campaign encompasses TV, print, transit, and collateral components. I think the campaign imagery is a great way to get our message out here about the saving grace of credit counselling. Today in Canada, debt management and financial education programs are playing an increasingly important role for income earners at all levels. Household debt hit a new record late last year. Credit market debt - as compared with disposable income - reached 163.7 percent, Statistics Canada reported in December. Too many Canadians are overextended thanks in large part to low interest rates. 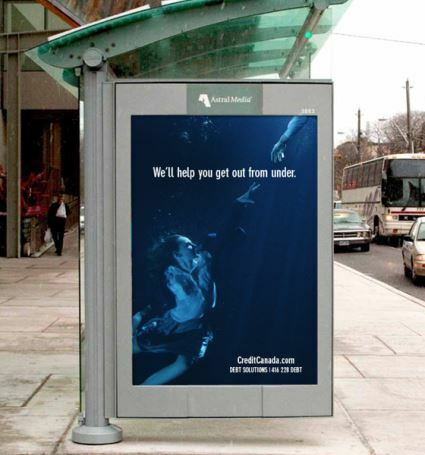 More and more people need help staying afloat financially, and we’re letting them know we can be the lifesavers. We’re telling people that our not-for-profit credit counselling, financial coaching, and financial literacy programs promote manageable ways to deal with debt, no matter how stormy the seas. In creating the advertising, we opted for simple, striking visuals and a sharply focused message. The 30-second TV spot shows a range of everyday, fully clothed people floundering underwater. As the commercial concludes, a hand reaches down into the water to clasp another hand representing those in distress. Over the action, reassuring words appear onscreen saying: “Without making a profit or false promises, we’ve helped over 2 million people since 1966 … We’ll help you get out from under.” The imagery and the key message from the TV commercial are reflected in all other elements of the campaign, promoting continuity and building on Credit Canada’s service strength, brand strength, and credibility. Bus back ads for the campaign reflect the TV advertising. Other transit ads also play into the mix. I’d like to thank the creative and production professionals in Toronto who helped Credit Canada develop and produce the campaign. Nice work all around.